Split Airport is located around 25km west of Split, past the Kastela series of towns and very close to the lovely town of Trogir. There are many ways to getting to and from Split Airport, you will be pleased to hear – read on below. There are frequent bus services that depart just outside the main terminal building of Split Airport. One of these services is the Croatia Airlines bus (supposedly timed to coincide with their flights) – you can see details of this on the Pleso Prijevoz website. A one-way ticket costs 40 Kunas, and journey time is approximately 30-40 minutes. You pay the driver/conductor on board the bus. There are also other buses running services for the same price/journey time – essentially, head outside the terminal building and look for any queue of travellers waiting to board a bus! These buses take you direct to the main bus station in Split, which is next to the train station and the port. Perfect if the first thing you intend to do in Split is to catch a ferry or bus to somewhere else! New for 2019 is a catamaran line that will connect the port near Split Airport to downtown Split. Run by Catamaran Line, the service will start on 1st May and operate eight times a day (each way) throughout the whole of that month (the same for October too), increasing in frequency to ten times a day (each way) from 1st June to 30th September. Journey time is only 20 minutes, and a one-way ticket costs 99 Kunas. Tickets can be purchased online or at the Riva Travel agency in Split. More details here: A new option for transferring from Split Airport – catamaran! There are two local bus services that take you from Split Airport to Split. Note that you catch these buses from the main road outside the airport, rather than from the terminal building. Bus number 37 operates on a route from Trogir to Split, whilst bus number 38 goes from the airport to the town of Kastel Stari, and then to Split. Bus number 37 would definitely be the better option to take as it is far more frequent. You can find more info on these two buses on the Promet Split website, and the number 37 bus in particular on their Airport bus line page. You will see that (from 6am to 10pm on weekdays) buses depart Trogir on the hour, at twenty past and at forty past. 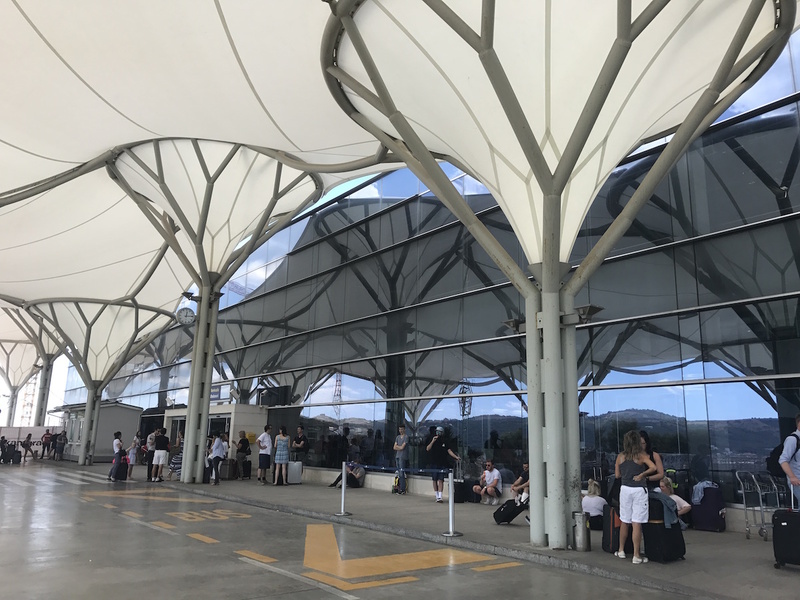 Buses will arrive at the stop outside Split Airport (remember, the stop is on the main road, not actually within the confines of the airport grounds) roughly five to ten minutes later. You can purchase a ticket on the bus itself (from the driver), which costs 17 Kunas. Journey time is about 50 minutes from the Airport to Split on bus 37. There are no restrictions on luggage but bear in mind that this is a local bus – you take your luggage with you on board the bus. This bus may also be quite busy/full at peak times. Note that these two local buses terminate at the local bus station (‘Sukoisan’) in Split, not the main bus station. From the local bus staion, you can either take another local bus (numbers 2, 9, 10 and 15 would be the most useful, as these go past Diocletian’s Palace and to the bus/train station and port area) or a taxi to your final destination. Walking from this bus terminal to the main one by the port would take about 10 – 15 minutes. A taxi from Split Airport to the main part of Split – to the bus/train stations, which are adjacent to the port and only a short walk to Diocletian’s Palace – costs around 250 Kunas. (Yes, this is a bit on the pricey side – unfortunately taxis in some parts of Croatia really aren’t all that cheap!) Journey time is about half an hour. If you want to save a bit of money, why not take the airport bus to the main bus station, and then a taxi from here to your final destination? The local journey within the city should only take about 5-10 minutes and will be relatively inexpensive. You should find waiting taxis parked up close to where the bus drops you off in Split. If you’re staying somewhere close to Diocletian’s Palace, then the best idea would be to walk to your accommodation – even if you do have luggage. It’s a short walk from the bus to the Riva (Split’s main, seafront promenade), with the Diocletian’s Palace area just behind it.